SAN FRANCISCO (AP) — A legendary San Francisco baseball memorabilia bar forced from its touristy spot in the city’s downtown has re-opened in equally touristy Fisherman’s Wharf. 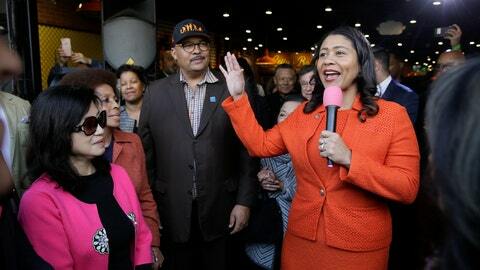 San Francisco Mayor London Breed helped cut the ribbon for the opening of Lefty O’Doul’s Ballpark Buffet and Cafe on Tuesday, along with owner Nick Bovis. Several hundred fans, including the city’s political elite, attended the ceremony, and the Archbishop Riordan High School marching band played. Lefty O’Doul’s left its long-time spot on Geary Street by the cable cars in January 2017 after a dispute with the building’s landlord. Francis “Lefty” O’Doul was born in San Francisco in 1897. He was two-time National League batting champion who was known as a colorful man about town, friend to Joe DiMaggio and an ambassador of baseball to Japan.